1. How Did Orthodoxy Reach Ireland? How did Orthodox Christianity come to this small green island off the shores of the European continent in the uttermost West? Unknown to many, Christianity in Ireland does have an Apostolic foundation, through the Apostles James and John, although the Apostles themselves never actually visited there. The Irish people were the westernmost extension of the vast Celtic civilization—whose people called themselves the Gauls—which stretched from southern Russia through Europe and eventually into the British Isles. (map below) The vastness of Celtic/Gallic civilization is evident in the names used to designate countries within its entire territory: the land of Galatia in Asia Minor, Gaul (France), Galicia (northwest Spain), and the land of the Gaels (Ireland). 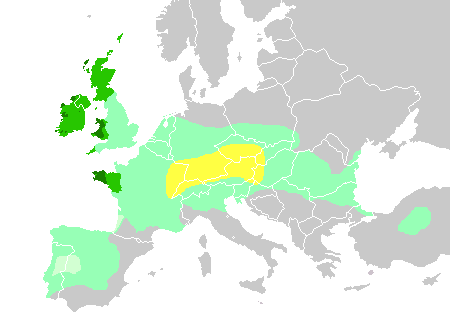 The Celtic peoples (like the Jews) kept in very close contact with their kinfolk across the Eurasian continent. When Christianity was first being spread by the Apostles, those Celts who heard their preaching and accepted it (seeing it as the completion of the best parts of their ancient traditions and beliefs) immediately told their relatives, traveling by sea and land along routes their ancestors had followed since before 1000 B.C. The two Apostles whose teachings had the greatest influence upon the Celtic peoples were the brothers James and John, the sons of Zebedee. After Pentecost, James first preached the Gospel to the dispersed Israelites in Sardinia (an island in the Mediterranean Sea off the east coast of Spain, which was used as a penal colony). From there he went on to the Spanish mainland and traveled throughout the northern part of Spain along the river Ebro, where his message was eagerly heard by the Celtic/Iberian peoples, especially those in Galicia. This area continued to be a portal to Ireland for many centuries, especially for the transmission of the Good News. John preached throughout the whole territory of Asia Minor (modern-day Turkey), and the many peoples living there accepted Christianity, including the Celtic peoples known as the Galatians (in Cappadocia). These people also communicated with their relatives throughout the Greco/Roman world of the time, especially those in Gaul. 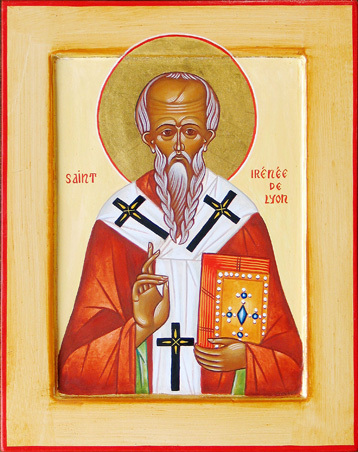 By the middle of the 2nd century the Celtic Christians in Gaul asked that a bishop be sent to them, and the Church sent St. Irenaeus (icon below), who settled at Lyons on the Rhone river. Among the many works St. Irenaeus accomplished, the most important were his mastery of the language of the local Celtic people and his preaching to them of the Christianity he had received from St. Polycarp, the disciple of St. John the Theologian. 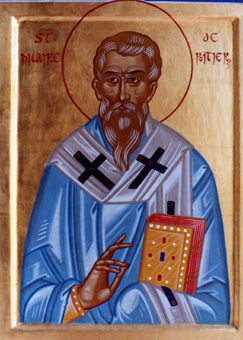 The seeds that St. Irenaeus planted bore abundant fruit in the person of St. Hilary of Poitiers, who, having lived in Asia Minor, would be the link between East and West, transmitting Orthodoxy in its fullness to the Celtic peoples. He was not only a great defender of the Faith, but also a great lover of monasticism. This Orthodox Faith and love for monasticism was poured into a fitting vessel—Hilary's disciple, St. Martin of Tours, who was to become the spiritual forefather of the Irish people. What Saints Athanasius and Anthony the Great were to Christianity in the East, Saints Hilary and Martin were to the West. By the 4th century an ascetic/monastic revival was occurring throughout Christendom, and in the West this revival was being led by St. Martin. The Monastery of Marmoutier which St. Martin founded near Tours (on the Loire in western France) served as the training ground for generations of monastic aspirants drawn from the Romano-Celtic nobility. It was also the spiritual school that bred the first great missionaries to the British Isles. The way of life led at Marmoutier harmonized perfectly with the Celtic soul. 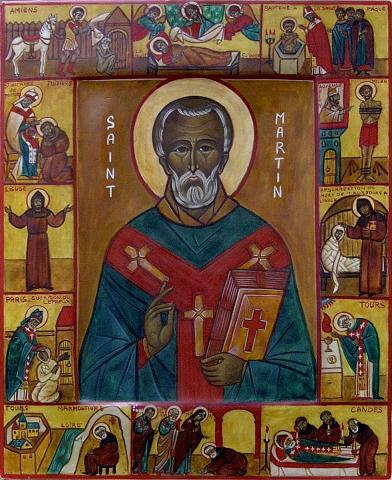 Martin and his followers were contemplatives, yet they alternated their times of silence and prayer with periods of active labor out of love for their neighbor. Some of the monks who were formed in St. Martin's "school" brought this pattern back to their Celtic homelands in Britain, Scotland and Wales. 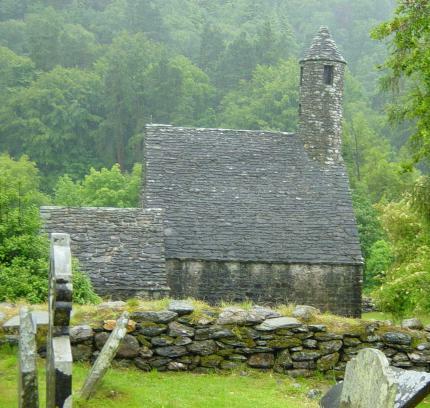 Such missionaries included Publicius, a son of the Roman emperor Maximus who was converted by St. Martin, and who went on to found the Llanbeblig Monastery in Wales—among the first of over 500 Welsh monasteries. 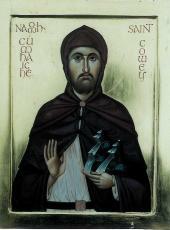 Another famous disciple of St. Martin was St. Ninian, who traveled to Gaul to receive monastic training at St. Martin's feet, and then returned to Scotland, where he established Candida Casa at Whithorn, with its church dedicated to St. Martin. The waterways between Ireland and Britain had been continually traversed by Celtic merchants, travelers, raiders and slave-traders for many centuries past, so the Irish immediately heard the Good News brought to Wales and Scotland by these disciples of Ninian. About the same time that the missionaries were traveling to and from Candida Casa amidst all this maritime activity, a young man named Patrick was captured by an Irish raiding party that sacked the far northwestern coasts of Britain, and he was carried back to Ireland to be sold as a slave. While suffering in exile in conditions of slavery for years, this deacon's son awoke to the Christian faith he had been reared in. His zeal was so strong that, after God granted him freedom in a miraculous way, his heart was fired with a deep love for the people he had lived among, and he yearned to bring them to the light of the Gospel Truth. After spending some time in the land of Gaul in the Monastery of Lerins, St. Patrick (451), was consecrated to the episcopacy. He returned to Ireland and preached with great fervor throughout the land, converting many local chieftains and forming many monastic communities, especially convents. It was during the time immediately following St. Patrick's death, in the latter part of the 5th century, that God's Providence brought all the separate streams of Christianity in Ireland into one mighty rushing river. While St. Patrick's disciples continued his work of preaching and founding monastic communities—it was his disciple, St. Mael of Ardagh (481), for example, who tonsured the great St. Brigid of Kildare (523)—several other saints who were St. Patrick's younger contemporaries began to labor in the vineyard of Christ. These included Saints Declan of Ardmore (5th c.), Ailbhe of Emly (527), and Kieran of Saighir (5th c.). Then came young Enda from the far western islands of Aran (off the west coast of Ireland). He studied with St. Ninian at Whithorn, and thus received the flame of St. Martin's spiritual lineage with its ascetical training and mystical aspirations. Having been fully formed in the Faith, St. Enda (530) returned to the Aran Islands, where he founded a monastery in the ancient tradition. It was on the Aran Islands that the traditional founder of the Irish monastic movement, St. Finian, drank deep of the monastic tradition established by St. Martin. 2. Why was Christianity Received so Quickly in Ireland? Why were the Celtic peoples able to receive Christianity so readily and so eagerly? The Church Fathers state that God prepared all peoples before the Incarnation of Christ to receive the fullness of Truth, Christianity. To the Jews He gave the Israelite revelation. Among the pagans, faint foreshadowings of the coming revelation were present in some of their beliefs and best qualities. The Celtic peoples were no different—in some ways they were better off than most pagans. On a natural level, the Celtic peoples had a great love of beauty which found overflowing expression as the Christian Faith, arts and culture developed in Ireland. Their extreme and fiery nature, which had previously been expressed through war and bloodshed, now manifested itself in great ascetic labors and missionary zeal undertaken for love of God and neighbor. Their great reverence for knowledge, especially manifested in lore, ancient history and law, made it easy for them to have great respect for the ancient forms and theology of the Church, which were based in ancient Israelite tradition. They had a great love for, and almost religious belief in, the power of the spoken word—especially in "prophetic utterances" delivered by their Druid poets and seers. These perceived manifestations of "the wisdom of the Other World" were held in great respect and awe by the Irish, as transmissions of the will of the gods, which could only be resisted at great peril. When many of their Druid teachers wholeheartedly accepted Christianity, and as Christians spoke the revealed word of God from the Scriptures or from the Holy Spirit's direct revelation, the people listened and obeyed. The Irish possessed an intricate and detailed religious belief system that was primarily centered in a worship of the sun, and a tri-theistic numerology—often manifesting itself in venerating gods in threes, collecting sayings in threes (triads), etc.—which led to the easy acceptance of the true fulfillment of this intuition in the worship of the Holy Trinity. They also treasured a very strong belief in the afterlife, conceived as a paradisal heavenworld in the "West" to which the souls of the dead passed to a life of immortal youth, beauty and joy. Even the societal structure of the Celts in Ireland prepared its peoples for Christianity. In contrast to the urban-centered and highly organized mindset which prevailed in the lands under Roman rule, Ireland (which was never conquered) preserved the ancient family- and communal-based patterns of rural societies. They did not build cities or towns, but settled in small villages or individual family farm holdings. The only recognized "unit" was the tribe and its various family clans, centered around their king's royal hill fort. The economy remained wholly pastoral, in no way resembling the Roman urban and civil systems. There were no city centers. The original apostolic family-based model of an ascetic community, and its later monastery-based form, manifested themselves in Ireland as a natural completion of what was already present. Finally, the leadership and teaching roles previously held by the Druids, poets, lawyers and their schools were naturally assumed by the monks and bishops of the Church and their monasteries. It was precisely because the monastic communities were like loving families that they had such a long-lasting and complete influence on the Irish people as a whole. These schools were the seedbeds of saints and scholars: literally thousands of young men and women received their formation in these communities. Some of them would stay and enter fully into monastic life, while others would return to their homes, marry, and raise their children in accordance with the profound Christian way of life that they had assimilated in the monastery. Some of the monks, either inspired by a desire for greater solitude, or by zeal to give what they had received to others, would leave the shores of their beloved homeland and set out "on pilgrimage for Christ" to other countries. Once again they would travel along paths previously trodden by their ancestors—both the pagans of long ago, and Christian pilgrims of more recent times. Because these monastic communities were centers of spiritual transformation and intense ascetic practice, they generated a dynamic environment which catalyzed the intellectual and artistic gifts of the Irish people, and laid them before the feet of Christ. In these monasteries, learning as well as sanctity was encouraged. The Irish avidly learned to write in Latin script, memorized long portions of the Scriptures (especially the Psalms), and even developed a written form for their exceedingly ancient oral traditions. When the Germanic peoples invaded the Continent (A.D. 400-550), the Gallic and Spanish scholars fled to Ireland with their books and traditions of the Greco-Roman Classical Age. In Ireland these books were zealously absorbed, treasured and passed on for centuries to come. Many Irish monks dedicated their whole lives to copying the Scriptures—the Old and New Testaments, as well as related writings—and often illuminated the manuscript pages with an intricate and beautiful art that is one of the wonders of the world. Much has been written about Ireland's wandering missionary scholars (see Thomas Cahill's bestselling book, How the Irish Saved Civilization). The vibrant, community-centered way of life and the deep, broad, ascetic-based scholarship of the Irish monks revitalized the faith of Western European peoples, who were both devastated by wave after wave of barbarian invasions and threatened by Arianism. More than this, the Irish monks evangelized both the pagan conquerors and those Northern and Eastern European lands where the Gospel had never taken root. For Orthodox Christians, however, there are further lessons to be gained from the examples of the Irish saints. These saints were formed in a monastic Christian culture almost solely based on the "one thing needful" and the otherworldly essence of Christian life. They represented Christ's Empire, and no other. They were Christ's warriors, motivated solely by love of God and neighbor, acting in accordance with a clear and firmly envisioned set of values and the goal of Heaven. Such selfless embodiments of Christian virtues are all the more important to us today, who live in an age characterized by the absence of such qualities. The unwavering dedication of the Irish monks drew the Holy Spirit to them. And when He came, He not only deepened and established their already-present resolution, but also filled them with the energy and grace to carry it out. This is what is needed and yearned for today. The task of the Orthodox Christian convert in the West today is to bridge the gap between our time and the neglected and forgotten saints of Western Europe, who were our spiritual forebears. As St. Arsenios said: "Britain will only become Orthodox when she once again begins to venerate her saints." In this task we are very fortunate to have had a living example of one who did this: St. John Maximovitch. During his years as a hierarch he was appointed to many different lands, including France and Holland. One of the first things he set out to do upon reaching a new country was to tirelessly seek out, venerate and promote the Orthodox saints of that land, that he might enter into spiritual relationship with those who did the work before him, and enlist their help in his attempts to continue their task. He considered the glorification and promotion of local Orthodox saints as one of the most important works that a hierarch could do for his flock. We too must actively labor to venerate our ancestral saints, and must enter into spiritual relationship with them as St. John did. While we should not merely "appreciate" their lives and their example as an intellectual or aesthetic exercise, neither should we selectively reinterpret their examples and way of life in the light of modern fashions and "spiritualities." We should, through our efforts, strive to bring these saints into as clear a focus as possible before our mind's eye, reminding ourselves of the fact that they are alive and are our friends and spiritual mentors. The saints are, according to St. Justin Popovich of Serbia (1979), the continuation of the life of Christ on earth, as He comes and dwells within the "lively stones" (cf. I Peter 2:5) that constitute His Body, the Church (cf. Eph. 1:22-23). Therefore, honor given to the saints is honor given to Christ; and it is by giving honor to Christ that we prepare ourselves to receive the Holy Spirit. May the saints of Ireland come close to us and bring us to the Heavenly Kingdom together with them. Amen. 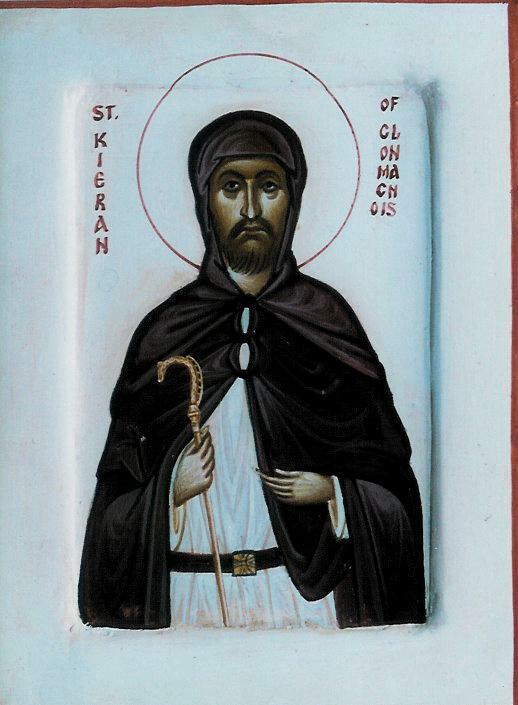 The great St. Columba of Iona (June 9, 597) described St. Kieran as a lamp, blazing with the light of knowledge, whose monastery brought wisdom to all the churches of Ireland. This earthly angel and otherworldly man was born in 512, the son of a carpenter who built war chariots. He was spiritually raised by St. Finian in Clonard (December 12, 549) and was counted among his "twelve apostles to Ireland." After spending some time in Clonard, the childlike, pure, innocent, humble and loving Kieran set off to dwell in the wilderness with his God. After three years, when more and more disciples began to come to him, he finally established a monastery in obedience to a divine decree shortly before he reposed. He was taken by his Lord to dwell with Him eternally at the age of 33. "Having lived a short time, he fulfilled a long time, for his soul pleased the Lord" (Wisdom 4:13). 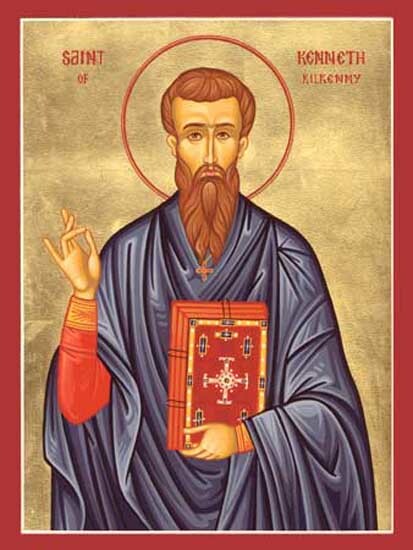 St. Kenneth was the son of a scholar-poet from Ulster. By race he was an Irish Pict and spoke the Pictish language. 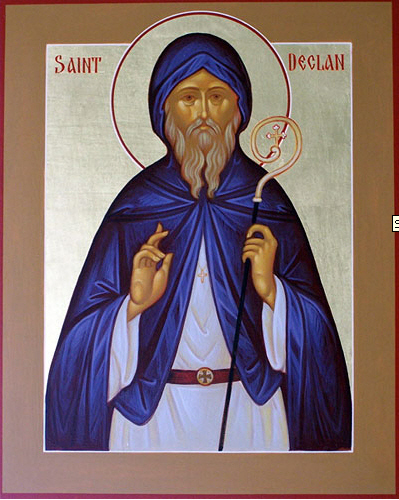 He was a disciple of the great monastic Saints Finian of Clonard (December 12, 549), Comgall of Bangor (May 11, 603), Kieran of Clonmacnois (September 9, 545) and Mobhi of Glasnevin (October 12, 544). After the death of St. Mobhi he took counsel from St. Finian. As a result (says the Martyrology of Oengus), St. Kenneth sailed off to Scotland. There he lived for a while on the isle of Texa, according to The Life of St. Columba by St. Adamnan of Iona (September 23, 704). While there he often visited his old friend St. Columba (who had lived with him in Glasnevin before departing for Iona) and helped him in his missionary labors to the Picts. Later, he traveled back to Ireland, where he founded the Monasteries of Aghaboe and Kilkenny before his death in the year 600. 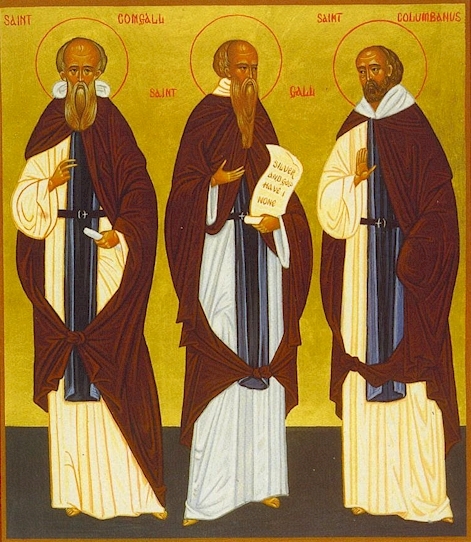 St. Finian, known as the "Tutor of the Saints of Ireland," stands with St. Enda of Aran at the head of the patriarchs of Irish monasticism. He showed great zeal and piety for God from his youth. He had already founded three churches before he set off for Wales to study at the feet of St. Cadoc at Llancarfan (September 25, 577). In Llancarfan he became close friends with St. Gildas (January 29, ca. 570), another of St. Cadoc's disciples. Upon his return to Ireland, he founded the great Monastery of Clonard during the very same year the great St. Enda (March 21, 530 ) reposed in Aran. 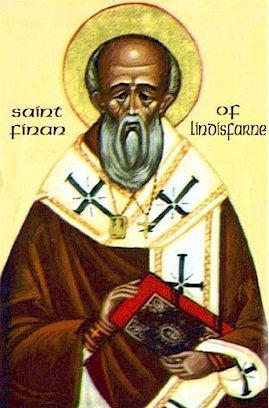 A multitude of illustrious and holy men studied under St. Finian, including the famous "Twelve Apostles of Ireland." St. Finian founded many other monasteries during his lifetime, including the famous island monastery of Skellig Michael off the southwest coast of Ireland. The gentle and motherly St. Ita was descended from the high kings of Tara. From her youth she loved God ardently and shone with the radiance of a soul that loves virtue. Because of her purity of heart she was able to hear the voice of God and communicate it to others. Despite her father's opposition she embraced the monastic life in her youth. In obedience to the revelation of an angel she went to the people of Ui Conaill in the southwestern part of Ireland. While there, the foundation of a convent was laid. It soon grew into a monastic school for the education of boys, quickly becoming known for its high level of learning and moral purity. The most famous of her many students was St. Brendan of Clonfert (May 16, 577). She went to the other world in great holiness to dwell forever with the risen Lord in the year 570. The well-known founder and abbess of the Monastery of Kildare has been revered and loved throughout Europe for almost fifteen hundred years. While she was still a young woman, her unbounded compassion for the poor, the sick and the suffering grew to such proportions as to shelter all of Ireland. 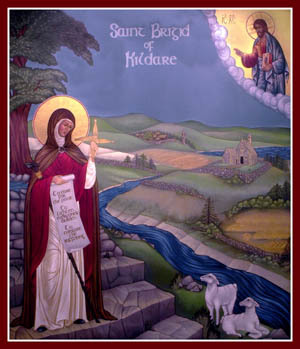 St. Brigid's tonsure at the hands of St. Mael of Ardagh (February 6, 488) inaugurated the beginning of women's coenobitic monasticism in Ireland. St. Brigid soon expanded it by founding many other convents throughout Ireland. The gifts of the Holy Spirit shine brightly upon all through her—both men and beasts—to this day. After receiving Holy Communion at Kildare from St. Ninnidh of Inismacsaint (January 18, 6th c.) she gave her soul into the hands of her Lord in 523. The future abbess and founder of the Ballyvourney Convent was born in the 6th century in the southern lands of Ireland. To escape a feud within their family, her household fled west to the Aran Islands and dwelt there for some time. It is possible that her family accepted Christianity while living in the islands. Gobnait began to zealously manifest her faith through her deeds, founding a church on the Inisheer Island. 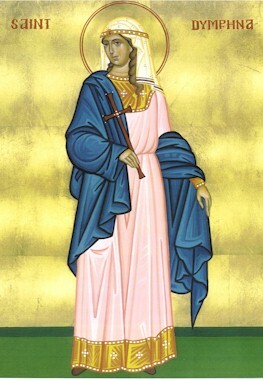 When she returned east with her family, she encountered St. Abban of Kilabban (March 16, 650), who became her spiritual mentor. Her family, greatly moved by their daughter's faith, gave her the land on which she and St. Abban founded the Monastery of Ballyvourney. In Ballyvourney her sanctity quickly revealed itself, especially through the abundant healings God worked through her prayers. Even the many bees that she kept paid her obedience, driving off brigands and other unwelcome visitors. While still a youth St. Oengus entered the Monastery of Cluain-Edneach, which was renowned for its strict ascetic life and was directed by St. Malathgeny (October 21, 767). He had an especially great love for the Lives of the Saints. After his ordination to the priesthood, he withdrew to a life of solitude. For his holy way of life many called him the "Cile D" (Culdee) or "the friend of God." After many people disturbed his solitude, he slipped away secretly and entered the Monastery of Tallaght, which was then directed by St. Maelruin (July 7, 792). He entered the monastery as a lay worker, laboring at the most menial tasks for seven years until God revealed his identity to St. Maelruin. There he mortified his flesh with such ascetic feats as standing in icy water. St. Oengus wrote the Martyrology of Tallaght with St. Maelruin. After Maelruin's death in 792, St. Oengus returned to Cluain-Edneach and wrote many more works in praise of the saints, including his well-known Martyrology and the Book of Litanies. He reposed in 824 and became the first hagiographer of Ireland. The most famous of all the saints of the Emerald Isle is undoubtedly her illustrious patron St. Patrick. Reared in Britain and the son of a deacon, St. Patrick was captured and enslaved by Irish raiders while still a youth. Thus, he was carried off to the land he would later enlighten with the Gospel: Ireland. During his captivity, the faith of his youth was aroused in him, and shortly thereafter he miraculously escaped his servitude. Some years later, he received a divine call to bring his new-found faith back to the Irish. For this task, he prepared as best he could in Gaul, learning from St. Germanus of Auxerre (July 31, 448) and the fathers of the Monastery of Lerins. 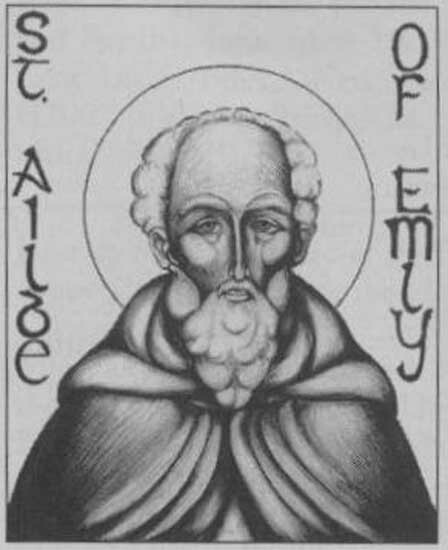 While in Ireland he ceaselessly traveled and preached the Christian Faith to his beloved Irish people for almost twenty years until his blessed repose in 451. St. Enda is described as the "patriarch of Irish monasticism." After many years living as a warrior-king of Conall Derg in Oriel, St. Enda embraced the monastic life. His interest in monasticism originally grew as a result of the death of a young prospective bride staying in the community of his elder sister, St. Fanchea (January 1, ca. 520). 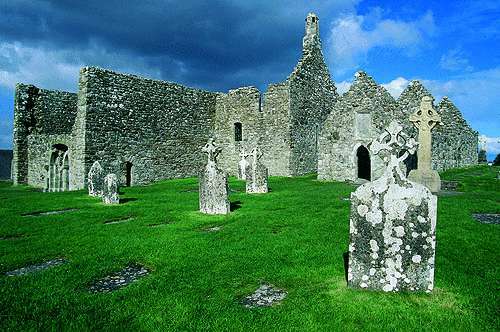 St. Fanchea suggested that he enter the Whithorn Monastery in southwestern Scotland. After some years in Whithorn he returned to Ireland and settled on the fallow, lonely Aran Islands off her western shores. During the forty years of his severe ascetic life there, he fathered many spiritual disciples—including Sts. Jarlath of Cluain Fois (June 6, 560) and Finian of Clonard (December 12, 545)—and laid the foundation for monasticism in Ireland. St Enda reposed in the year 530 in his beloved hermitage on Aran. St. Dymphna was the daughter of a pagan king and a Christian mother in Ireland. When her mother died, her father desired to take his own daughter to wife. Dymphna fled with her mother's instructor, the priest Gerberen, to the continent. Her father followed and eventually found them. When Dymphna refused to submit to his unholy desire, he had them both beheaded at Gheel in what is today Belgium. Throughout the centuries she has shown special care and concern from the other world for those suffering from mental illnesses and is greatly venerated throughout Europe and America. The path of St. Kevin's early life was well laid. When St. Kevin was between the ages of seven and twelve, he was tutored by the desert-loving St. Petroc of Cornwall (June 4, 594), who was then studying in Ireland. After St. Petroc left for Wales, the twelve-year-old St. Kevin entered the Monastery of Kilnamanagh. There his humility and the holiness of his life amazed all. After his ordination to the priesthood he followed his tutor's desert-loving example and set out to establish his own hermitage. He settled in an ancient pagan cave-tomb on a crag above the upper lake of Glendalough. For many years he lived in this beautiful desert wilderness like another St. John the Baptist. All the animals behaved toward him as with Adam before the Fall. Disciples soon gathered around him and St. Kevin was constrained to become the founder and Abbot of the famous Glendalough Monastery. He died at the great old age of 120 in 618 and went to his Lord. 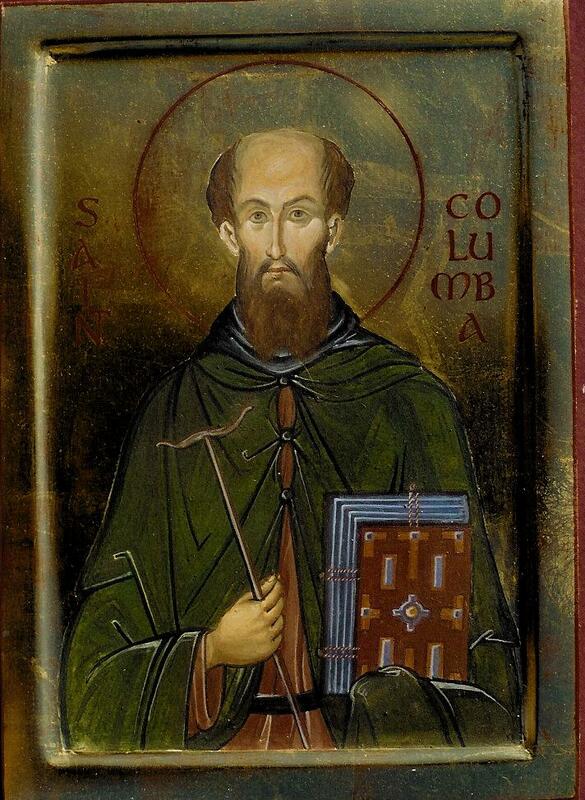 St. Columba (or Columcille) is one of the greatest of all the saints of Ireland. Born into an exceedingly prominent noble family, the Ui-Niall clan, he forsook his wealth and all earthly privileges and laid his ample natural gifts at the feet of the Lord, becoming a monk at a young age. He studied under some of the holiest men of his day, including Saints Finian of Clonard (December 12, 549) and Mobhi of Glasnevin (October 12, 545). After St. Mobhi's death, St.Columba went on to found the monasteries of Derry and Durrow. He traveled as a missionary throughout his beloved Ireland for almost 20 years. In 565 he settled on the island of Iona, off the west coast of Scotland, where he remained for 32 years and brought about the conversion of many. He reposed on Iona in great holiness on June 9, 597. St. Cowey is a little-known monastic saint who lived near the tip of the Ards Peninsula in the late 7th and early 8th centuries. For many years he labored there as a hermit, sending up his prayers to God during his long nightly vigils in the depths of the forest. Three holy wells are still to be found where he labored, as well as an ancient church built amidst them, which looks eastward over the Irish Sea. Beside the church, an ancient cemetery completes the view that greets the pilgrim's eye. St. Cowey's holiness attracted many to his quiet, little hermitage. Tradition holds that he was made abbot of the great Moville Monastery further north on the peninsula in 731, possibly shortly before he reposed around the middle of the 8th century. His memory has been kept and treasured by the local inhabitants of the nearby town of Portaferry for over twelve hundred years. Both the early Church of Syria and the early Church of Ireland were famous for their extraordinary ascetics—men and women who were so affected by the touch of Divinity that they fled from all that might interfere with their struggle, even renouncing their reason. Syria gave the Church the stylites, and also the "grazers": severe ascetics who lived almost like animals, having no dwellings and eating whatever vegetation grew in their vicinity. The Irish manifested a similar form of sanctity in the geilt, who were a cross between fools-for-Christ and the Syrian grazers. The most famous of all the geilt was St. Suibhne of Dal-Araidhe, formerly a violent Irish chieftain whose murdeous ways brought the curse of God upon him. In his profound repentance, he took upon himself the extreme ascetic way of life of the geilt, living in the open-air wilderness. Before St. Suibhne died he gave a life confession to his spiritual father, St. Moling (722). St. Moling preserved this account in the form of a long poem. This poem has come down to us today, having been only slightly altered over the years (in very obvious places). It is not only very beautiful poetry but also a spiritually instructive autobiographical document. The Saint foresaw that since he had previously lived by the sword, he would die by violent means. He was murdered at the end of the 7th century in St. Moling's monastery and buried nearby. Article published in English on: 29-3-2010.